Local self-governments have been selected for awards or special recognitions in four areas evaluated within the first National Annual Competition for Best Practices in the Application of Good Governance Principles at the Local Level for the year 2018. 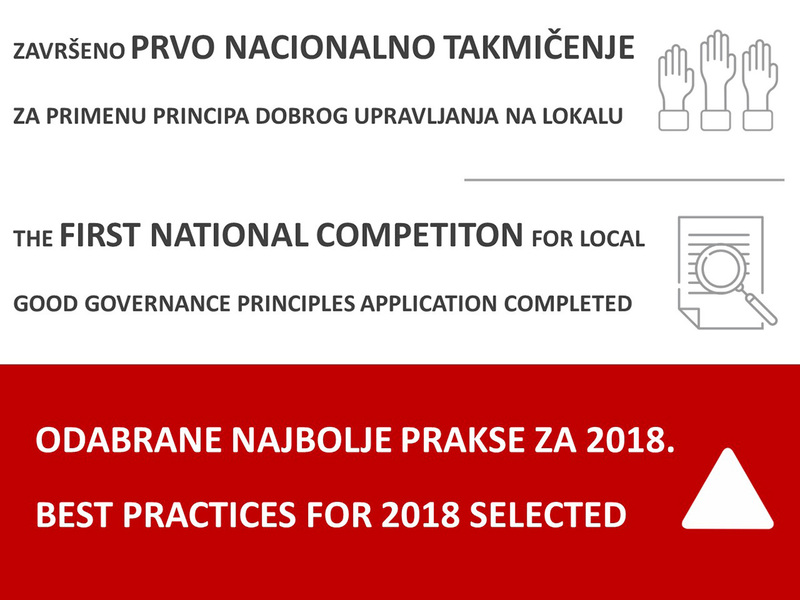 While Novi Pazar, Ruma, Vlasotince and Vračar are the winners of main awards in the areas of Efficiency and Accountability; Transparency and Public Participation in the Work of the Local Self-Government (LSG); Accountability and Rule of Law and Equality and Non-Discrimination, Inđija, Užice, Nova Varoš, Veliko Gradište, Pirot, Bečej, Raška and Pančevo were awarded special recognitions. The awards ceremony will be held on 21 February 2019, and establishment of the awards and the fact that the competition is implemented by the Ministry will help the Government of Serbia make it a long-term measure. The full Decision of the Committee, chaired by Assistant Minister of Public Administration and Local Self-Government, Saša Mogić, is provided below. You can find the Committee’s Decision here. The National Competition for the Selection of Best Practices in the Application of Good Governance Principles at the Local Level is realised within the Project Enhancing Good Governance at the Local Level. The project is implemented by the Ministry and the Standing Conference of Towns and Municipalities – the Union of Towns and Municipalities (SCTM) as part of the Programme Enhancing Good Governance and Social Inclusion for Municipal Development – Swiss PRO, implemented by the United Nations Office for Project Services (UNOPS). Total funds to be awarded to local self-governments (LSG) for best practices in the application of good governance principles within the National Competition, amount to 12,000.00 USD. The winners in each of the four areas are eligible for financial award in the amount of 3,000.00 USD. The Committee for the Selection of Best Practices in the Application of Good Governance Principles at the Local Level was established in the Decision issued by the Minister of Public Administration and Local Self-Government no. : 401-00-470/2018-24 of 16 January 2019, and item 2) of the said Decision provides that the Task of the Committee is to determine award winners in each of the four categories, based on verification criteria and evaluation of received applications. The Committee has unanimously decided to review the application of the town Užice for the area of Transparency and Participation in the area Efficiency and Effectiveness, because the results shown contribute more to making a positive change in this area. The award in the area of Efficiency and Effectiveness goes to the town Novi Pazar, which uses an e-registry office to enable more efficient and effective provision of services to citizens using a modern approach to case processing, including data exchange via the e-ZUP system, electronic submission of applications and option for monitoring applications for all procedures involving citizens and businesses, in line with the models of administrative procedures designed by the Ministry and SCTM. The award in the area of Transparency and Public Participation in the Work of the Local Self-Government goes to the municipality Ruma, which sets high standards with its examples of public participation in making important local decisions, adopting programmes, plans and measures, as well as examples of enabling public participation in budget development and monitoring, in the area of citizen participation in important decision-making, particularly related to the adoption of the budget, which also contributes to higher accountability of the LSG decision-makers themselves. The award in the area Accountability and Rule of Law goes to the municipality Vlasotince, which has, in cooperation with the municipality Bojnik, through the procedure of establishment and management of the newly established public entity for addressing the issue of increased number of stray animals (dogs) demonstrated how this issue can be addressed systemically in other LSGs also, and how intermunicipal cooperation, adhering to the accountability principle and respecting relevant legal norms, can be efficiently used as a mechanism to address communal and other issues under the purview of LSG units. The award in the area Equality and Non-Discrimination goes to the city municipality Vračar, which has, through a comprehensive and inter-sectoral approach, with its examples of the provision and promotion of accessibility of LSG services to persons with disabilities demonstrated that it is possible to significantly improve the quality of life of persons with disabilities, as well as to, through citizen participation in planning, but also project activities, achieve wellbeing for vulnerable populations as well as other citizens, by raising their awareness about the issues and challenges faced daily by persons with disabilities, and motivating them to show solidarity and contribute to activities of assistance and support to all vulnerable populations. After the ceremony to give the awards and recognitions to towns and municipalities for best practices, SCTM will sign grant agreements with the LSGs that have been awarded funds. The LSGs shall use the awarded funds according to pre-determined purpose and contents, in line with provisions set out in the Agreement. The award will be paid in RSD according to project exchange rate on the date of signature of Agreement.